I’m back on this lovely Cyber Monday with the tenth installment of what my kids have been reading lately. My kids are 8 and 11 years old. That’s 3rd and 6th grades. I have one kid who goes to school with a book to read on the bus. I have another child who is ‘forced’ to read 25 minutes a day for homework. It’s a bit of a mixed bag in our household, but I still LOVE to read out loud to my kids and they enjoy that too! All of these books should be available in your local library. If you’re shopping online for children’s books this holiday season, please consider clicking on one of my links. 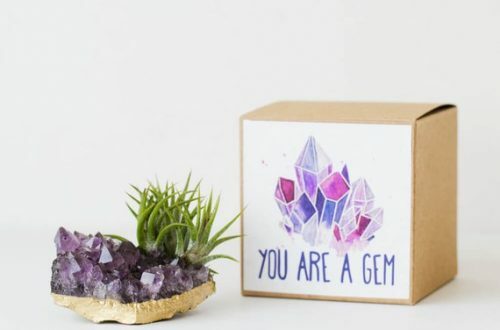 If you do end up making a purchase of any random item using one of my affiliate links to get you to that particular site (It doesn’t cost you more and I don’t see what it was or know it was you) then I get a small commission from the retailer. It is usually pennies on the dollar, but over time they add up and help pay to keep this blog online. And we all like it when Handy Husband doesn’t have to lecture us about hackers and server and hosting fee costs, right?!?! Right! Here’s the latest round up of what my kids are reading. The Treehouse Books should not be confused with The Magic Tree House books by Mary Pope Osborne. The Treehouse Books, starting with The 13-Story Treehouse , are geared for 3rd to 5th grades and are very similar in writing style to the Captain Underpants series with less, well, underpants. Seriously though, there is far less potty humor, so if you are a parent you might appreciate that. 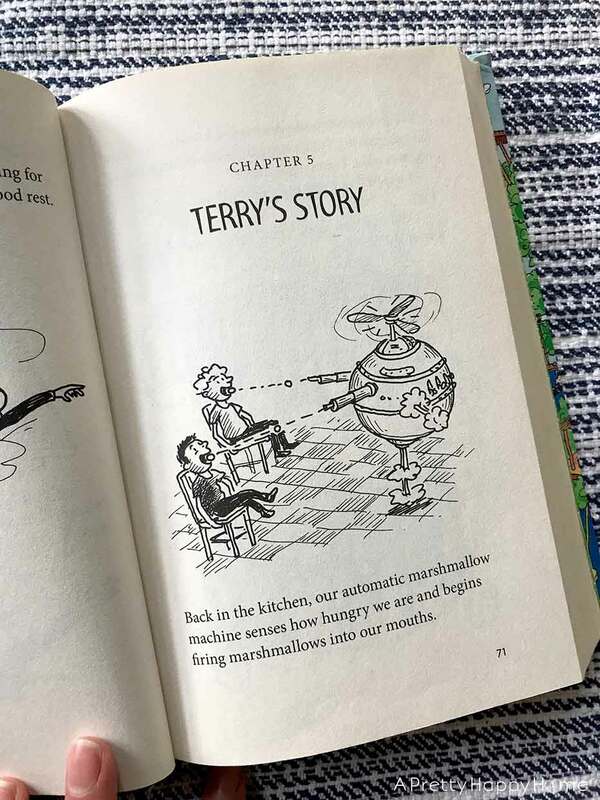 Andy and Terry, the main characters, live in the most incredible treehouse in the world. It has a bowling alley, a swimming pool and in each story the treehouse gets bigger and more elaborate, as do their adventures. 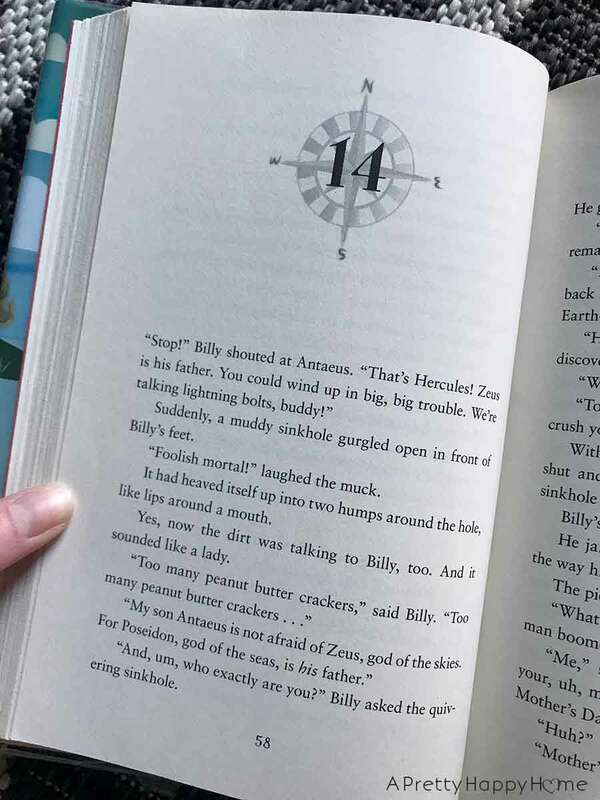 I mentioned in my last book post that my 8-year-old son was anti-reading again. We started reading the Treehouse Books in late August and he WAS HOOKED. He finally sat quietly for story time. He read ahead on his own in these books. I actually didn’t read any of the last three books with him. They were all consumed on his own. I’m a little sad that he’s cruised through the entire series in 4 months because now what is he going to read? The below photo is from The 39-Story Treehouse . If your kids are just being introduced to this series, here’s a boxed set of the first 5 Treehouse books (13, 26, 39, 52 & 65 Story Treehouse). 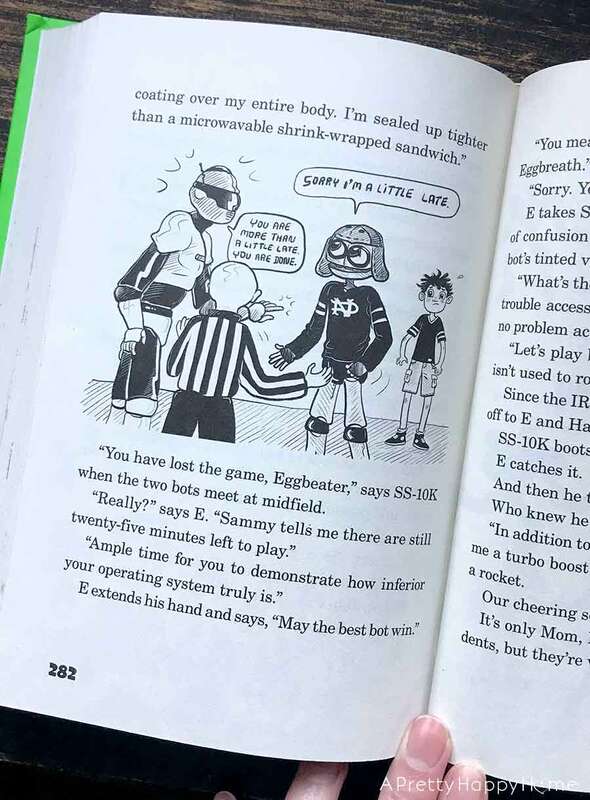 I recently helped out at my son’s elementary school book fair. Yes, it was amazing to unpack all the books. It was also an organizing nightmare because of ALL THE BOOKS and all the different sizes they come in. Trying to get them to fit on the shelves was tricky! One of the series that was very popular at the book fair was the I Survived series. At least once a month one of these books comes home with us from the library. The stories are just believable enough to make you think you are reading a non-fiction account of one of the historical events the main character survives. My kids ask me WILD questions that I can’t possibly know the answers to. 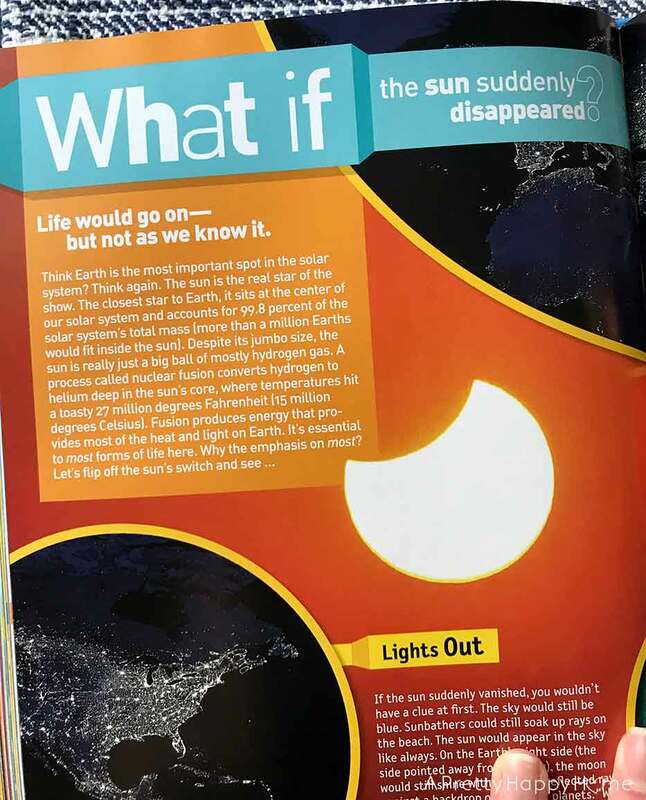 One of the questions they have asked me is what would happen if the sun disappeared? I had no definitive answer to that question, so we watched a YouTube video about that topic. Should have gone to the library instead because look what’s inside this book! What I love about these type of books is that I find them interesting too! If your kiddo is interested in The Supreme Court, then I’d recommend reading this picture book. 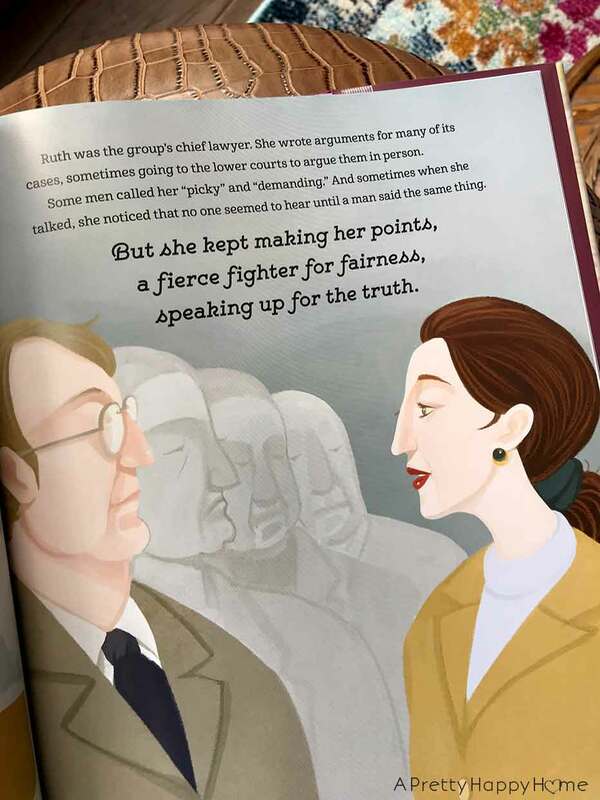 Ruth Bader Ginsburg is a fantastic role model for all kids as someone who has fought for women’s rights. In doing so, she always sought to demonstrate that when women aren’t treated equally it negatively affects men and children too. The Island of Dr. Libris was one of the MOST CLEVER stories my 11-year-old and I have read in awhile. If you’d like to see Hercules, Pollyanna and Robin Hood come to life in one book, then read The Island of Dr. Libris ! A side note about the author Chris Grabenstein. He wrote another of our favorite children’s books, Mr. Lemoncello’s Great Library Race , which I will be surprised if it isn’t turned into a movie. Grabenstein’s imagination is off-the-charts amazing. I don’t know how he brings these stories to life, but I’m glad he does! This is the second House of Robots book we’ve read. The story is fast-paced, fun-to-read and appeals to both my 8 and 11-year-old. The authors also wrap things up nicely with a strong moral at the end, which I always appreciate. 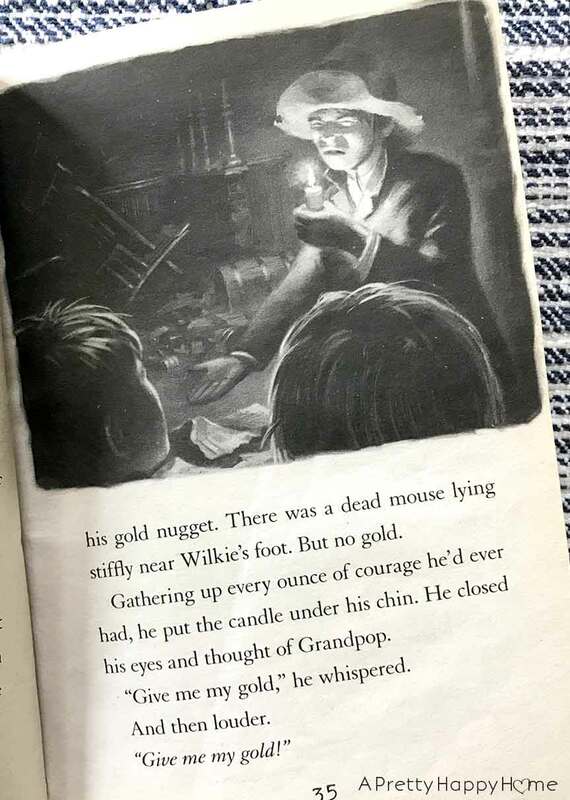 Maybe he had his head in a book? The Marvels is illustrated so beautifully it is a book you will want to keep. 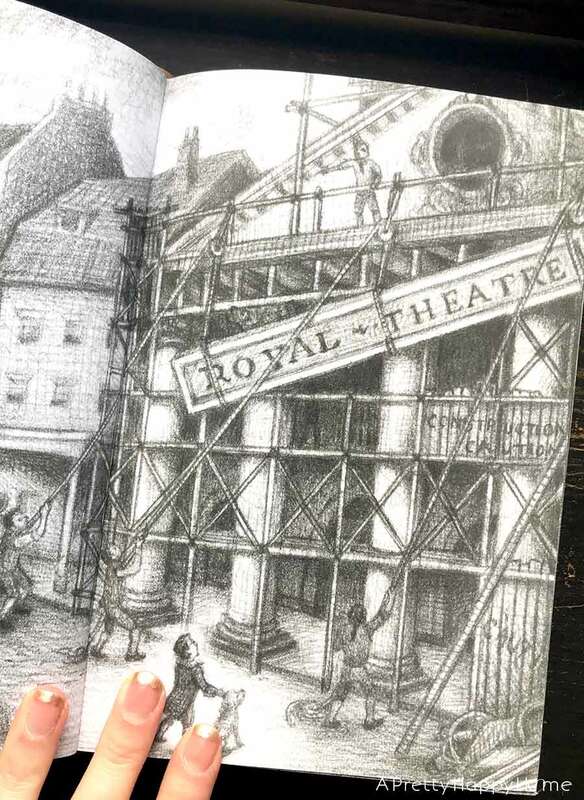 Almost 400 of the 672 pages in the book are all illustrations that tell a detailed story that begins in 1766. The second half of the book is in prose and takes place in 1990 in London. Joseph Jervis runs away from his boarding school to find his uncle, Albert Nightingale. His uncle lives in a strange old house that captivates Joseph. 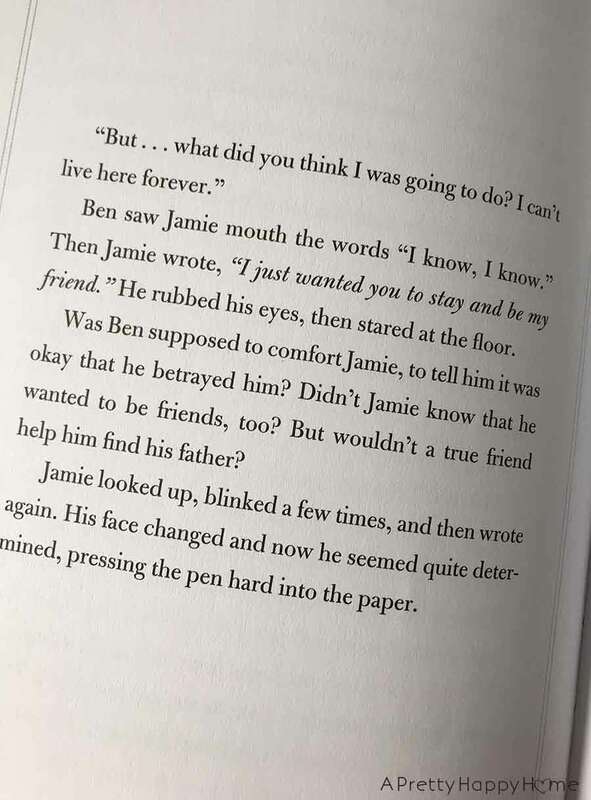 On his journey to discover the home’s secrets and the secrets of his eccentric uncle, Joseph will discover how the illustrations in the book connect to his uncle’s life. I don’t have words to describe this story where nothing is as it seems at first. It’s poignant and tugs at your heart. In the end, I suppose it was really all about love. It’s definitely a story that will stay with you. I should say, my 3rd grader was not at all interested in this book. My 6th grader LOVED it, as did I. 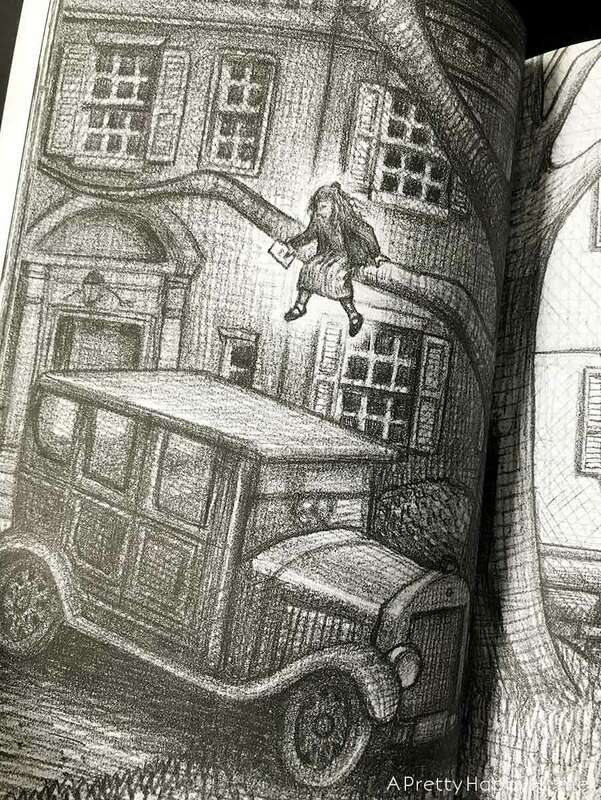 My daughter and I loved The Marvels so much that we also read another book by Brian Selznick, Wonderstruck . The characters in the illustrations and the written story follow a similar journey set many years apart. 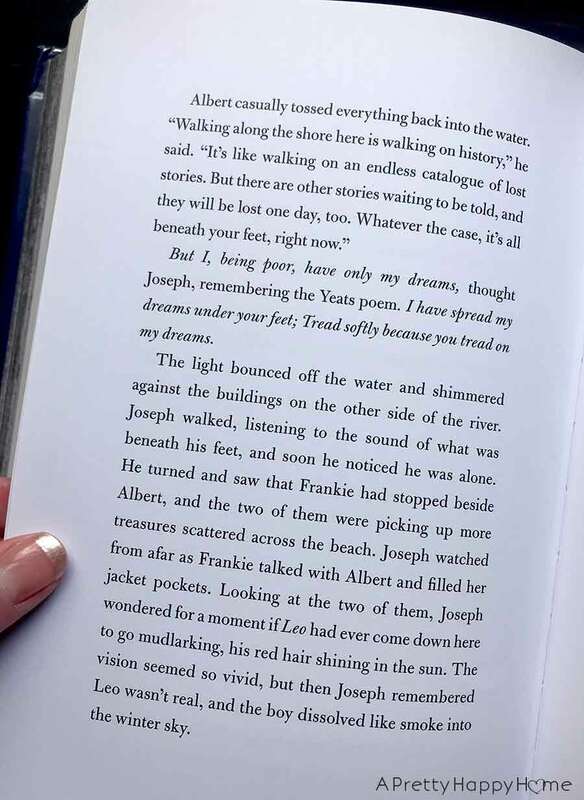 It isn’t until the end of the book that you find out how the two stories are connected. I had a hunch of what was going to happen and I was wrong! I also confess that I read ahead without my daughter because I just HAD TO KNOW how the book ended! The other thing I liked about Wonderstruck is that a couple of the characters had a disability. 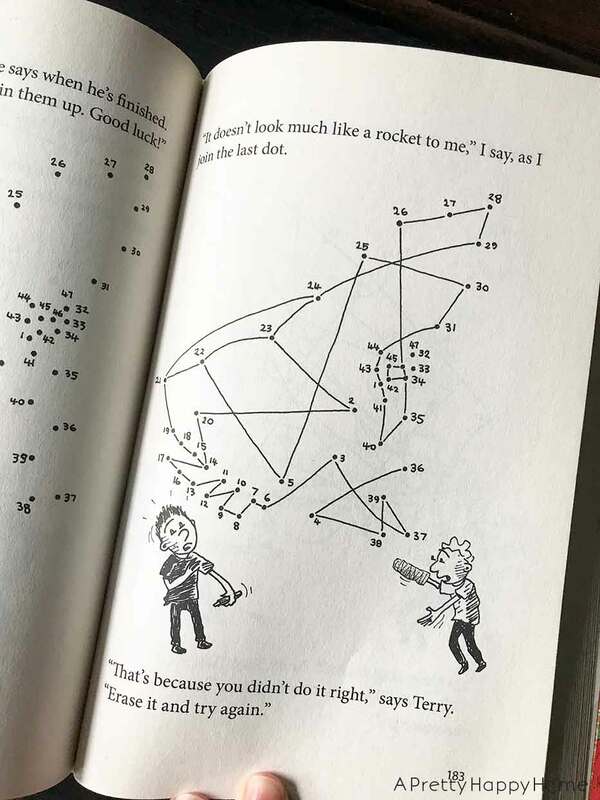 If you haven’t had personal experience with a particular disability then books can be the next best way to teach that just because someone is different in one way it doesn’t mean they are different in all the other ways. Does that make sense? I volunteered at our local country school library for many years, and yes, a highlight was setting up for book fairs. Our school was K through 8, so we had a broad range of books to put out. It was gratifying to see how excited kids got over books! I just finished listening to an audiobook version of one of my daughters’ favorites—The Mixed Up Files of Mrs. Basil E. Frankweiler. It was written in the 70’s, times were very different then, but I love the story. Impressionable kids should read it with caution, however, as its storyline includes running away from home. I’ve never met your son of course, but that’s who I pictured as the young boy! 😊 It’s right up there with The Best Christmas Pageant Ever in the “books we can always read” category. Thank you for your blog. And we missed seeing your mother in law at our nursing reunion. Happy Holidays! Now I need to see if I can find The Mixed Up Files at the library! I’m not sure if we read The Best Christmas Pageant Ever or not… Maybe I should remedy that! We just read Trouble for Trumpets, which is a picture book from 1984. It had really neat illustrations. And another classic we are reading right now is Stone Fox and I’m not looking forward to crying at the end! I am so happy to know that you are reading to your children and encouraging them to read. I love to read and my boys loved to read when they were young. Kevin reads a lot now. I think Brian reads some but he is so busy he doesn’t take the time to sit down and read. Of course the boys had the best reading teacher ever. I will be forever grateful to your grandmother for her teaching abilities. Her motto was ” every child will learn to read before they leave my classroom.” She always accomplished that to. She taught me to read too! I often think that it is the gift that unlocked the entire world for me. If you can’t read, it is a terrible disadvantage going forward. Not insurmountable, but I can’t imagine my life without being able to read.